I was supposed to leave Aleppo on the 10th, along with Cedric, but I decided to stick around for another day, to rest, write and soak in some more of Aleppo. And that is pretty much what I did! 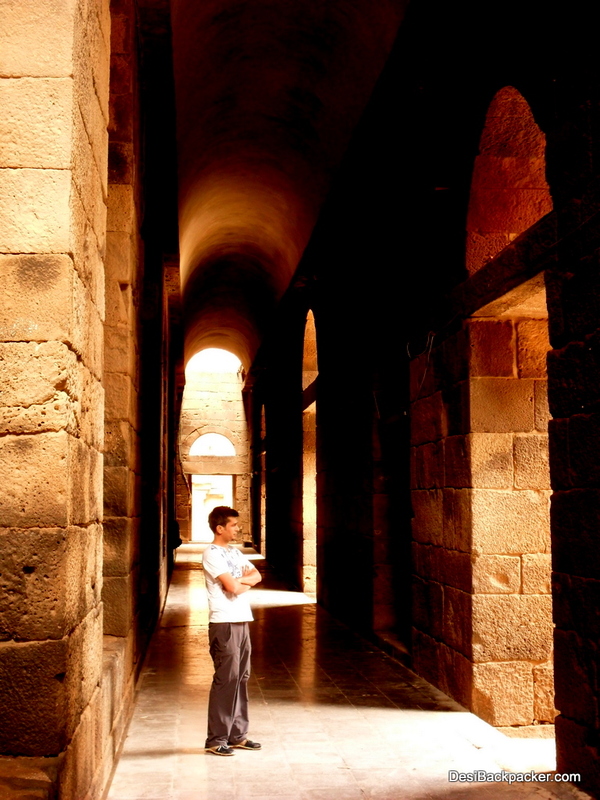 Syria is known as the cradle of civilizations. History here goes back further than in most countries, and the list of empires that have fought over, won and lost this land is longer than that of Paris Hilton’s “boyfriends”. 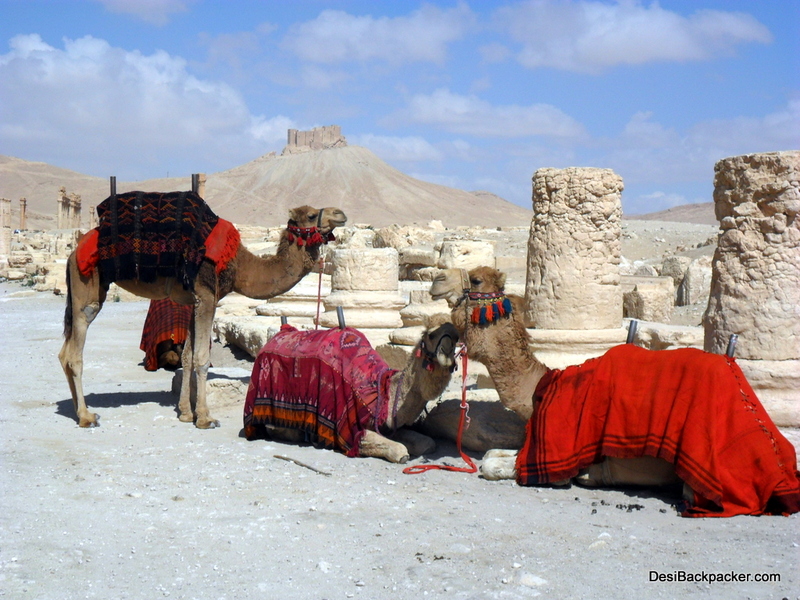 Beach resorts, castles, ancient ruins, desert towns… you name it, Syria has it. I visited Damascus, Bosra, Palmyra, Hama and Aleppo, and wanted to see a lot more places (such as Lattakia, the “Dead Cities”, Tartous, Apamea, Saladin’s Castle, etc) but time was a restricting factor. Of course, being on the list of the “Axis of Evil” countries Syria doesn’t get nearly as many tourists as does neighbouring Turkey, or even Jordan and Lebanon. Unlike this blog’s readers, however, the tourists have no idea what they’re missing. Unfortunately, the government’s policies don’t make it too easy for tourists to visit the country. The official line of the Syrian embassy in India is – “We don’t issue tourist visas”. Of course, such statements never have and never will deter the truly intrepid traveller. Travelling around Syria is a breeze, the buses are fast and efficient, and the train system is reputed to be functional, if less popular than the bus network. Syrians have the reputation of being exceptionally nice and friendly, and they didn’t disappoint. 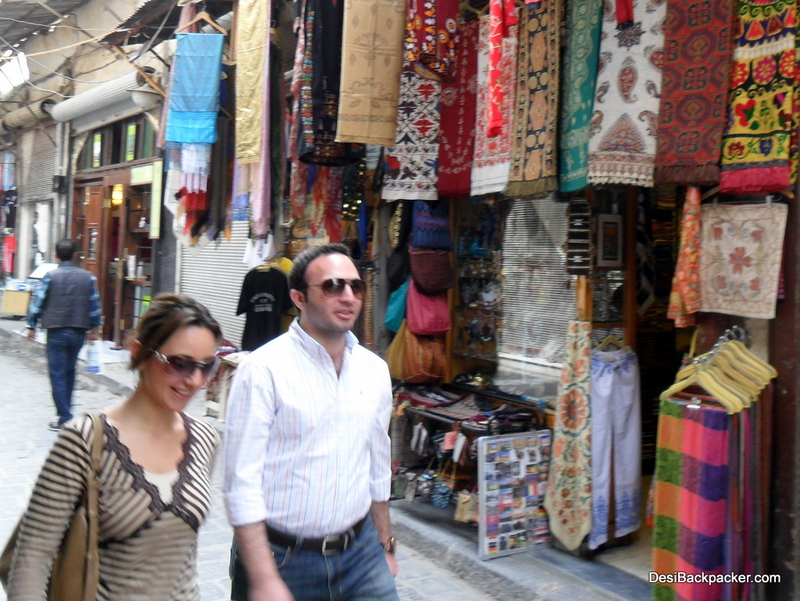 From my host Mustafa and his friends – to shopkeepers in the souq – everyone was very welcoming. 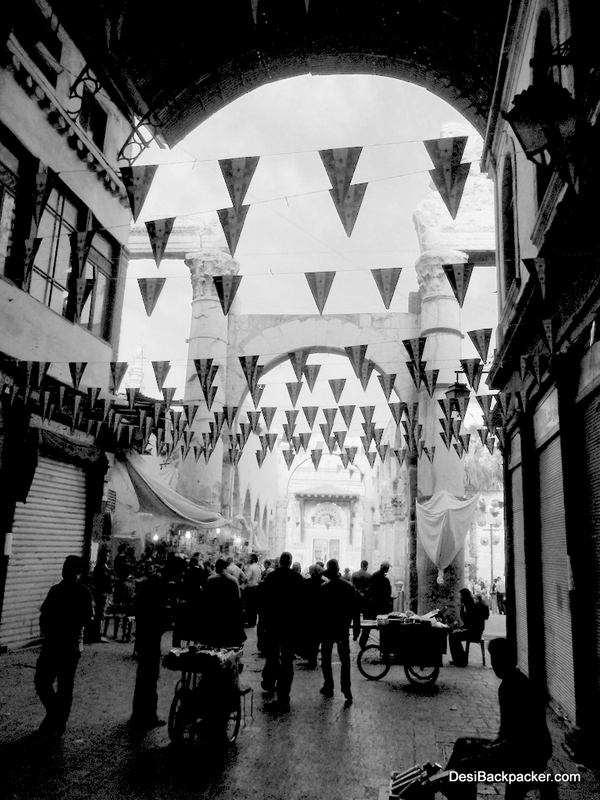 In the streets of Hama or the souqs of Damascus or Aleppo, it was always the same. People would ask me – “You from Pakistan? India?”, and on hearing the response, it was always the same – “Welcome to Syria”. The vendors, even after realising that I wasn’t buying anything, were always ready with a smile and a “welcome”. In most of Syria people are too fair skinned for me to pass off as a local, but in the Palmyra bus station, the guys expressed surprise (“ajnabi! ?”) when I pulled out my passport for identification. One thing that I noticed early on and initially found quite irritating was the way they express confusion. A lean-in, a rapid shake of the head, with an upward movement of the chin and a light raise of the eyebrows to indicate that you need to repeat yourself. Eventually this gesture grew on me, and I found it quite endearing later on. I found the same habit later in Turkey too. Another curious observation was the kissing: When guys meet or say goodbye, they place one kiss on the right cheek followed by two kisses on the left cheek. Cheeky! I had also expected to see most men wearing the “keffiyeh”– the Arab headdress and most women wearing burqas and hijabs. While there certainly were plenty of those, the cities also had lots of people walking around in clothes that wouldn’t be out of place anywhere in the world. I discovered that Syria is actually a secular country. The mistake we make is that we equate the word “Arab” with the people and places in “The Gulf”. Whereas “The Gulf” is only one small portion of the Arab World. The majority of the world’s Arabs can not relate to (and sometimes even resent) the people from “The Gulf”. The other Syrian “citizens” I noticed were the camels. They are huge and furry, unlike the bald ones found in India. The Syrian Desert can actually get quite cold as I witnessed in Palmyra, so I guess having all that fur does come in handy. 1. It is cheap. You can expect to spend anywhere between 20-75 SYP for a good street-side meal (Shawarma, Falafel, etc). In decent restaurants, good meals can be had for around 150. A bottle of water or a can of Coke costs 20-25 and you’d pay 50-75 for a beer in a shop. A tea/coffee in a traditional coffee shop costs 15/25 SYP. A bed in a shared dorm is 250-300 SYP, and the cheapest room with a double bed would cost about 500-600 on average. A 2-hour bus ride costs about 100 SYP, and local buses are 6-10 SYP. Entrance fees to tourist sites are a bit steep by Syrian standards, with heavy discounts for holders of an International Students Identity Card (ISIC). E.g. : The Krak Des Chevaliers: 150 SYP standard, 10 SYP with a student discount! 2. At around 47 Syrian Pounds to the US dollar, the currency is currently is almost at par with the Indian Rupee! So no complicated conversions. 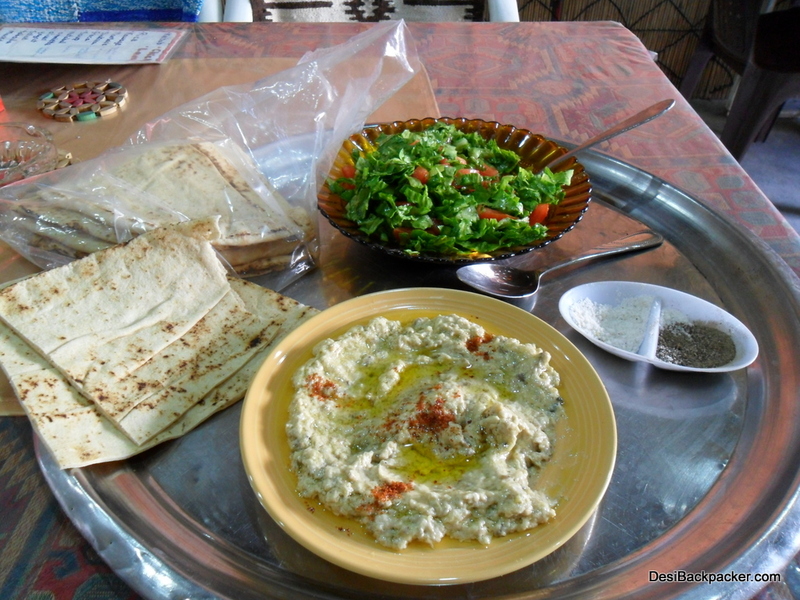 The food in Syria is really delicious, and as I mentioned before, cheap. As a bonus for many Indian travellers, a lot of the food is actually vegetarian! There are many excellent dishes without a trace of meat – Falafel, fuul, etc. Even the shawarma stands stick to chicken and lamb. One thing that was hard to get used to was the habit of keeping flatbread on the table. The food is in the dishes but bread is kept directly on the table! Tea (“shai”) is without a doubt the most popular beverage in Syria, and it’s taken milk-less, strong and sweet. Coffee (“kahve”) is also popular and the grounds are left in the cup like in Turkish coffee. Alcohol, contrary to my expectations, is widely available in restaurants, supermarkets and small street-side shops. In fact, when it comes to alcohol, Syria seems to be a lot more liberal than India! 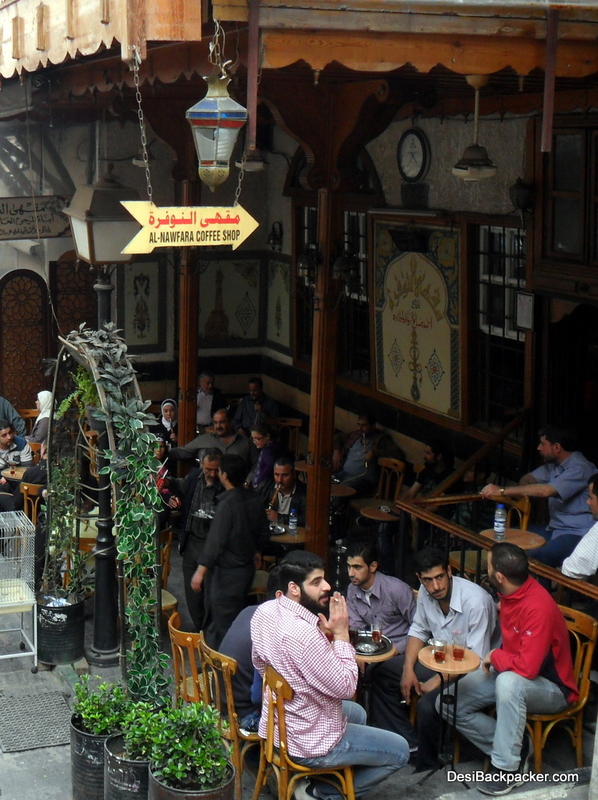 The coffee shops are a hub of activity, with people gathering and spending hours just chatting, smoking nargileh (the water pipe), playing cards or backgammon and drinking copious amounts of tea and coffee. The newer establishments play host to patrons of both sexes but the older ones are mostly home to old well-dressed men, sitting around and watching the passers-by. Some signboards have just Arabic and French! Arabic is perhaps too hard to even try and learn if you are going for a short trip, but your experience will definitely be much, much richer if you can learn a little bit as English speakers are very hard to find here. Even French is much more useful. A lot of the official tourist literature available at the sites is in French. 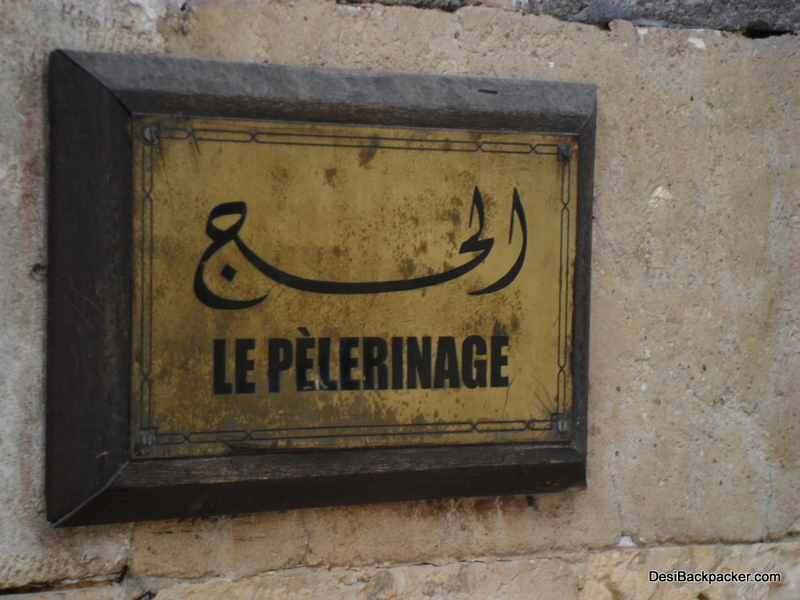 The labels at many tourist sites such as the Azem Palace in Damascus, Palmyra and others are in French! I also noticed that there are quite a few common/similar words with Hindi/Urdu (ajnabi, shukran, etc and lot more which I promptly forgot). 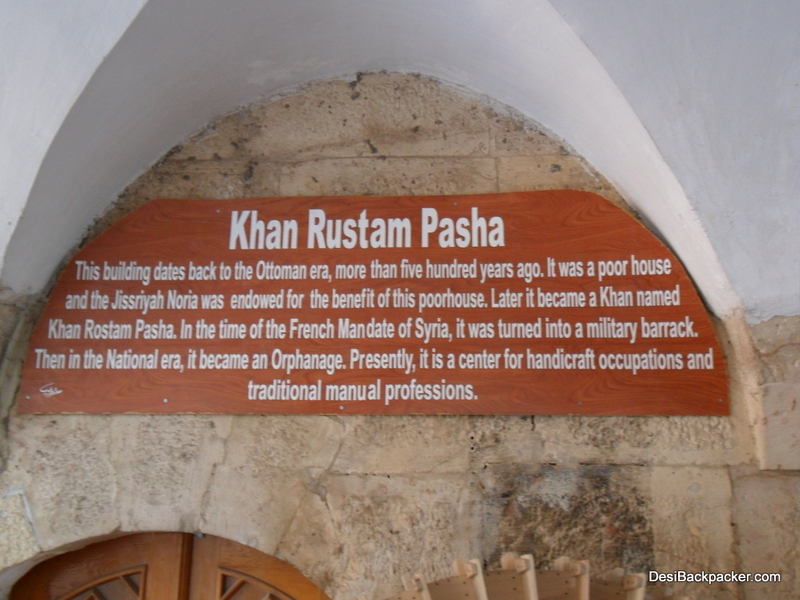 One interesting word is “Khan” – a khan was a place in the souq where traders could stay. 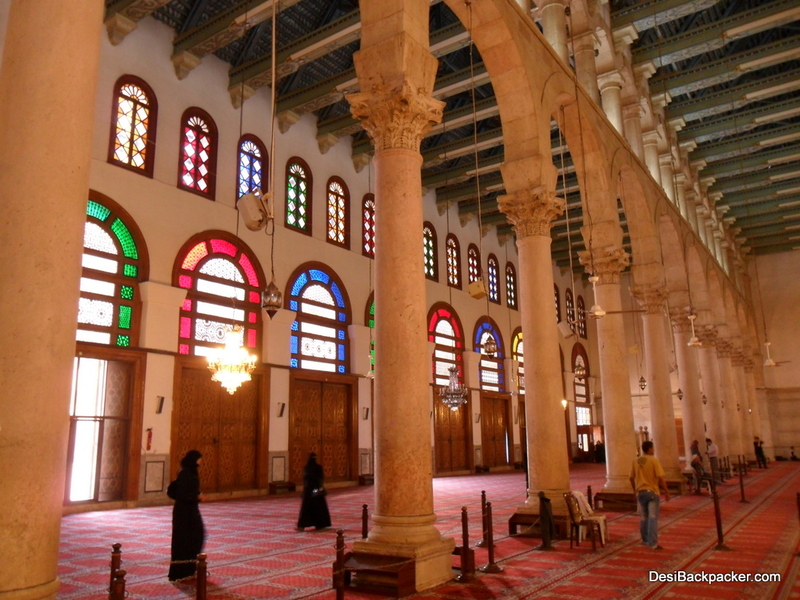 There are lots of these in Damascus, Aleppo and Hama (and I believe in other cities as well) and are well worth a look for their open courtyards and architecture. The “Big Brother” is always watching. I know of two incidents (one second hand and the other I was a witness to) where young men were picked up by the police, questioned intensively and beaten up before being let go, all simply because their profiles deviated slightly from that of the standard working-class male. And in the second incident, I heard one of the guys (who returned from the police station with facial bruises and a limp) describing how the police had printouts of his Facebook updates and Yahoo chats! I also noticed quite a few men with bruised faces walking around in Damascus with pronounced limps. Now this could be a coincidence but I doubt it. The policy of prevention is very much in place. Friday is the day that’s the most tense, as the mosques are full during the weekly prayers, leading to the largest gatherings. Now, the two Fridays that I was in Syria, there was no internet between the hours of 11 AM and 2 PM (at least). Coincidence? Also, I had set aside one day to visit Bosra, a town in the south close to Daraa, where most of the “action” has been focussed so far. Now, when we passed the halfway point, GPRS internet access on cellphones stopped working, and resumed as soon as we crossed the halfway point again on the way back? Coincidence? On its own, sure. But together with the other two, I’m not quite certain. It’s all in the family. Bashar al-Assad, the current “president” is the son of the last one, and the constitution was changed to allow him to take over the position from his father, as he wasn’t old enough at the time. The last “revolt” aggainst the Assads was by the Muslim Brotherhood in 1982 and it led to the brutal Massacre of Hama. Of course, this is just my opinion, but I bet the son would only be too keen to follow the example set by his father. Syria has been in a State of Emergency since 1962, and that means that there are effectively no constitutional protections for Syrian citizens! 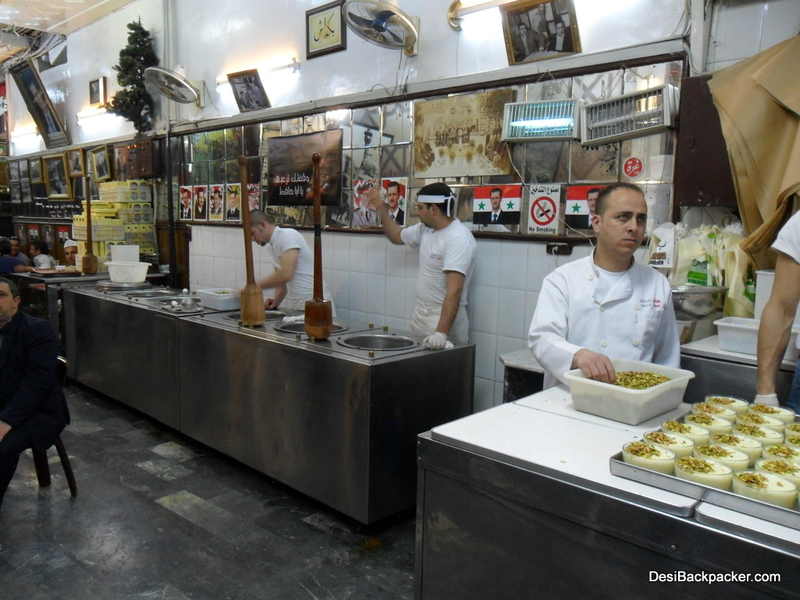 Bakdash Ice Cream Shop, Damascus. Notice the generous splattering of Assad's pictures. They are literally EVERYWHERE! This entry was posted in Syria and tagged Featured, RTW2011, Syria. Bookmark the permalink. 10 Responses to Syria roundup: people, places, food, money, revolution. Nice! I met a couple of Syrians here in Geneva & as far as the people and their way of life is concerned, you seem bang on. Have fun in your future journeys & keep on updating us. Very interesting post Animesh but be safe in this part of world …as bloggers are high targets these days ..:)Looking like you are slowly becoming our "Anthony Bourdain"
Very interesting summary Animesh– gives a peek into the life there, besides what the news have been covering. So where is the desi back packer headed to now? Thanks! The trip is ongoing. After Syria it was Turkey, Greece, Italy and now Spain. I need to catch up on the blogging front! by the way.. the name of that dish is Baba Ghanooj..